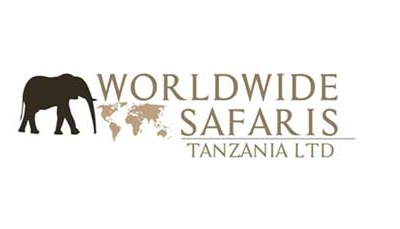 Worldwide Safaris Tanzania Limited is a small, highly experienced Tanzania's tour operator. Over the years we have hosted a great number of international visitors on private guided tours in Tanzania and safaris in Kenya, Uganda, Rwanda, Ethiopia, Namibia, Botswana, Ethiopia and South Africa. Our office is based in Arusha - Tanzania, the tourism city of Tanzania, from where we coordinate our services. The safari and tour guides employed by Worldwide-Safaris Tanzania Limited are based in various regions and cities throughout the country. The Worldwide - Safaris team has visited all the accommodations and destinations that we propose on many occasions. 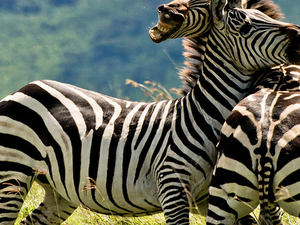 This enables us to provide clients with well-informed advice and unforgettable African safari tour itineraries. Our 7-day, 6-night safari to Tarangire, Ngorongoro and the Serengeti with Danford (aka “Dannyboy”) as our guide was the most memorable and spectacular experience of our lives. After weeks of thoroughly researching our options for a relatively affordable safari (not camping, but also not high-end luxury), we chose Worldwide Safaris and requested Danford. Danford was an extraordinary guide! He not only had an uncanny ability to spot wildlife from a distance, but also could knowledgeably answer nearly every question about the animals that we threw at him (and we indeed had many questions). Danford navigated the dirt roads in the parks like a pro and knew his way around the vast landscapes, at times offering help to other less experienced guides. Moreover, he was simply a pleasure to be around and his sense of humor and jovial personality raised our level of enjoyment to new heights. We experienced many long laughs together and had many interesting conversations sharing our cultures with each other. We still keep in touch with him. Do yourself a favor and make a request for Danford to be your guide. You will not be disappointed. In Tarangire, Ngorongoro and the Serengeti, we saw lions, prides of lions, lion cubs, leopards, cheetahs, cheetahs eating their kill, giraffe, elephants, baby elephants, rhinos, hippos, wildebeest migrating, zebra, buffalo, and much much more. I’ve attached photos of wildlife that we took while on our trip. Our vehicle had charging ports for our camera batteries, an adjustable open top which was indispensable for wildlife viewing, and was well stocked with bottles of water. Danford also brought along a superb pair of binoculars that we were able to use whenever we desired. As for making all of the arrangements, Ernest was quick to reply to our messages and willing to work with our many requests to come up with the perfect itinerary and accommodations combination. 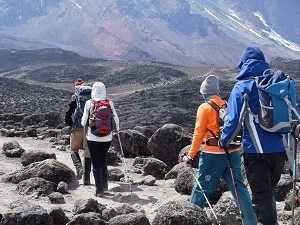 For example, since we were arriving at Kilimanjaro Airport mid-day after having overnighted at a hotel in Addis Ababa, we figured we would be well-rested enough to make the 2-3 hr drive from the airport to the Tarangire area even though most travelers overnight in Arusha first. Ernest had no problem modifying the itinerary. We stayed at Sangaiwe Lodge (Tarangire), Tloma Lodge (Ngorongoro), Mbugani (Serengeti for 2 nights), Mbugani Ndutu (Serengeti) and Olea Africana (final night). All were great (I will review them separately). Again, this was an incredible experience made possible by our guide Danford and Ernest with the logistics. If we go back to Tanzania, we will be using Worldwide Safaris. 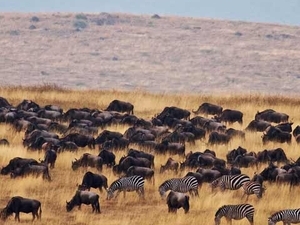 We booked a 14 days customized safari program in the northern circuit including the following National Parks: Tarangire, Lake Manyara, Ngorongoro Crater, Ndutu region and central Serengeti. Already before coming to Tanzania the communication and planning was excellent - thank you so much again Ernest!!! Our guide and driver for the trip was Danny. He is a very experienced guide who seems to know everything about the animals, the Massai and Tanzania in general. We kept asking questions and always got very comprehensive answers. We had thoughtful, meaningful conversations, as well as light-hearted fun. He taught us Swahili and spotted and named so many animals and birds, I lost count! He skillfully navigated the driving and found refreshing places for lunches. He was over-the-top accommodating in every way. This is something so important for such kind of a trip - thank you very much again - Danny!!! Besides, we had all the time we wanted to watch the animals and take pictures. The accommodation were also beyond our expectations. The camping in well presented and equipped tents was complemented by Paulo, our personal cook, making traditional food, if we needed anything Ernest and Dickson(Trainee) was there for us and the 4 nights in tented camps was a big spoil with luxury. Even for the non predictable things, they took good care of us. With the rainy season late and no activity at Ndutu, Ernest rearranged our itinerary accordingly to give us the best animal activity. Ernest also did all our bookings to Zanzibar and Dar es Salaam for an extra 6 days and everything, including local transfer flights and pick-ups, were all on schedule. Go with World Wide Travel and you will have an absolutely unforgettable experience.